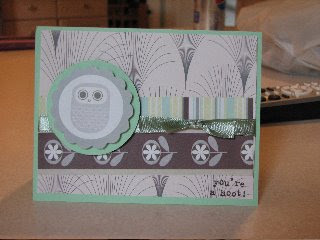 Made this card this morning. I found an awesome deal on a scrapbook package that was on clearance for $6 including an album, embellies, ribbon, etc.. regular $25, I didn't particularly like the album, but it had some really cute paper and whatnot. All of this is from the kid except the green base cardstock.